Trying to choose Arnold's best look is like attempting to pick his best movie one-liner. His physique has undergone so many changes over the years, each one awesome in its own way, that it becomes the proverbial apples vs. oranges debate. 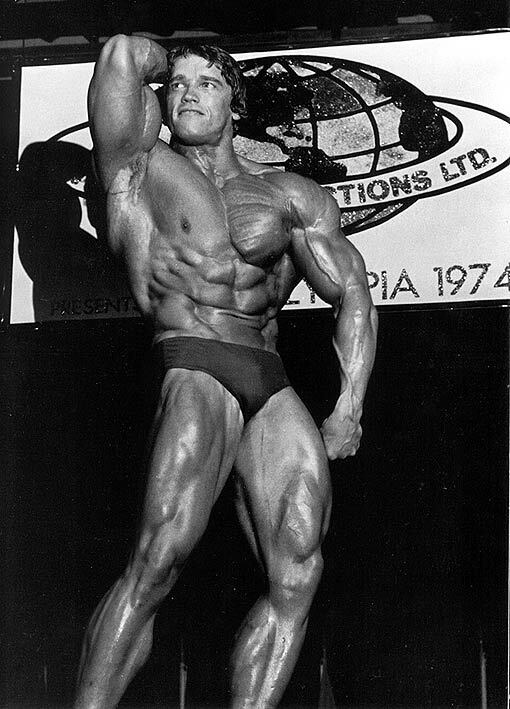 But many bodybuilding pundits agree that Arnold's peak shape - onstage, anyway - came at the 1974 Mr. Olympia, a year prior to the contest filmed for the movie Pumping Iron (which causal fans assume was Arnold's most impressive showing). On the 40th anniversary of that competition, we look back at how Arnold's physique has followed his amazing career, changing for contests, movies, and the demands of a life as public as any ever lived. Arnold cut the range of motion on his bench presses one-quarter of the way from lockout in order to keep tension on his pecs. On wide-grip pullups, however, he lowered his body until he felt a deep stretch in his lats, which activates them better. Arnold used this routine on Tuesdays and Thursdays. Bench Press superset Wide Grip Pullup, 5 x 10-12. Dumbbell Flye superset Seated Cable Row, 5 x 10-12. Dip (to failure) superset Bentover Row, 5 x 12. Cable Crossover superset Dumbbell Row, 3 x 12. On Oct. 12, 1974, Arnold swaggered onto the stage at New York City's Felt Forum to meet Lou Ferrigno. Though the man who would be Hulk was four years younger and 20 pounds heavier, Arnold's smirk grew wider as he hit his first few poses. At 240-plus pounds, yet with a waistline that still measured just 34 inches, Arnold had brought his best-ever body to the Olympia dais -- and he knew it. He'd decided months earlier that he'd retire from bodybuilding after that night, and wanted to punctuate his reign over the sport by leaving no doubt that he was the greatest bodybuilder ever. His blend of mass, symmetry, and definition was absolutely perfect. His arms were thick, his already legendary biceps fully peaked. Even Ferrigno, at 6'5", couldn't out-muscle him. At the same time, Arnold hadn't sacrificed any of the definition he'd shown the year before. When he hit his chest poses, lines etched across his pecs as if being chiseled in right before your eyes. His abs and thighs, though never his strong suit, were sharp and fully formed. He had no weak point. He was the best bodybuilder in the world. Arnold began training at age 15. While his focus was always on bodybuilding, he wanted his muscles to be not only aesthetic but also powerful. Heavy training in the form of Olympic weightlifting and powerlifting were part of his routines almost from the beginning. Understanding that the traps and spinal erectors developed best with heavy clean and deadlift movements, Arnold worked up to sets of only 5, 3, and from time to time, single reps. "By forcing myself to go to the limit," he wrote in his 1985 book The New Encyclopedia of Modern Bodybuilding, "I counterbalanced the lighter-weight, higher-rep training that made up the majority of my workouts." 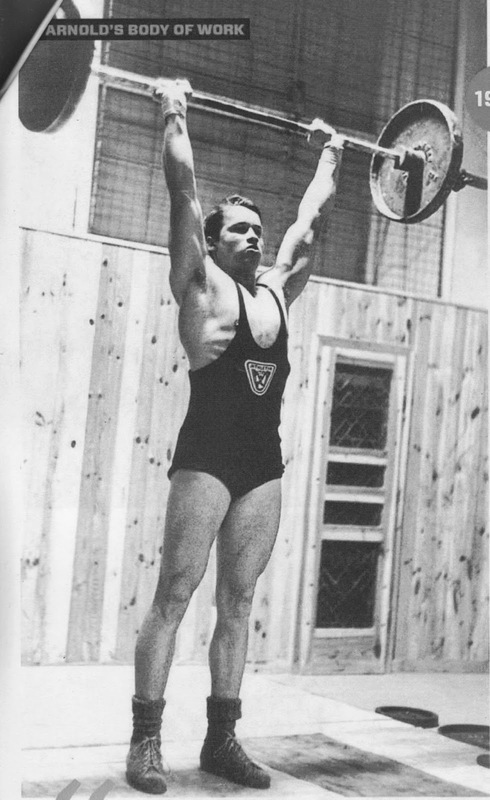 After less than a year of training, Arnold made his first contest appearance ever, in a weightlifting competition held in a beer hall by the Athletic Union in Graz, his hometown. He clean and pressed 150 pounds. "The crowd gave a big cheer," he wrote in his 2012 biography Total Recall. "The applause had an effect like I'd never imagined." Buoyed by the audience, Arnold pressed 185 on his next attempt -- "35 pounds more than I ever had before . . . I discovered that I performed much, much better in front of others." This routine, which Arnold followed in the mid-60s, combines conventional bodybuilding training with Olympic weightlifting exercises that build brute strength. He rested as long as needed, sometimes up to five minutes, between sets of heavy exercises. Clean and Press - 5 x 5. Push Press - 6, 4, 2. Upright Row - 10, 6, 4. Lateral Raise - 3 x 10. Barbell Curl - 3 x 10. Overhead Triceps Extension - 3 x 10. 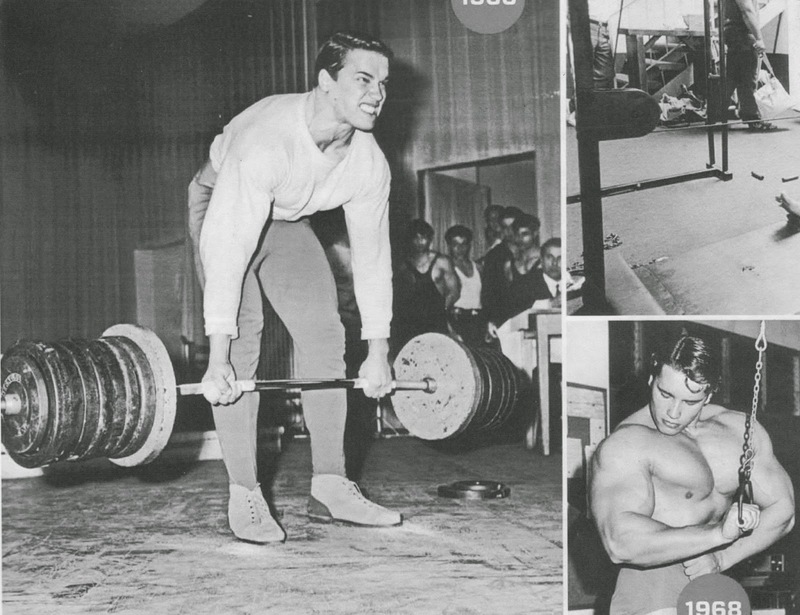 Later, Arnold had other victories in strength competitions, including the International Powerlifting Championships and the 1967 annual Munich stone-lifting contest, in which he hoisted a 560-pound stone -- with no warmup. By the end of the 1960s, Arnold weighed 250 pounds, had a 520 bench press, and carried a physique that was rough and lacking definition, but undeniably Herculean. Of course, Arnold's flirtation with powerlifting led to his friendship with future Mr. Olympia Franco Columbu, who Arnold in turn encouraged to take up bodybuilding. As Arnold wrote in his Encyclopedia, "Franco and I started out as weightlifters, which gave us a muscle density that bodybuilders who have not done power training lack." As Arnold's film career took off in the late 1970s, his training shifted to suit whatever role he had to embody. As he told Men's Fitness in 2012, "When I did Stay Hungry, [director] Bob Rafelson made me lose 30 pounds. So two-thirds of my training was cardio and one-third was weight training." In contrast, when Arnold made Conan the Barbarian, "they wanted me to look like a powerful guy who had gotten his body through fighting and hard work. I had to be big and strong but not as defined so I did heavier weight training." In general, throughout Arnold's prime film-making years, he used lighter training loads and incorporated more circuit work, sometimes doing a set of up to six exercises in a row without rest. The intense pace kept his heart rate up, allowing him to burn more calories and stay lean while keeping every muscle group pumped. It also allowed him to accomplish workouts in well under an hour, which made his travel and shooting schedules more manageable. Arnold was renowned for having a massive trailer delivered to sets of his movies, so that he could train between shooting scenes. He even allowed his coworkers to work out in it, included ex-wrestler (and fellow future governor) Jesse Ventura, while making Predator in the Mexican jungle. In 1997, Arnold underwent open heart surgery to repair a defective valve, and doctors cautioned him to reduce the intensity of his training going forward. In 2003, he needed shoulder surgery after an accident on the set of Terminator 3 -- the shoulder was operated on again in 2012. The exercises are done as a circuit. The number of circuits depends on how much time he has. He rests two minutes after the calf raise, and after the circuits are done, finishes off with the Swiss Ball crunch. High Intensity Intervals - use an exercise bike or elliptical machine. Work hard for 30 seconds, then go easy for 30 seconds. Repeat for 10 minutes. 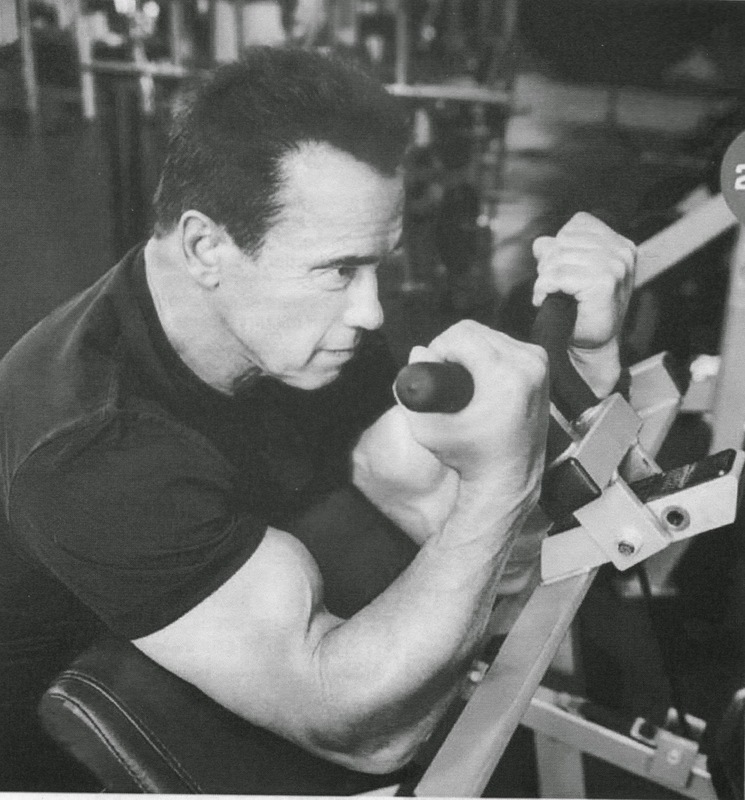 As governor of California from 2003 to 2011, Arnold relied more on cardio, for heart health and to burn off fat. Though old age and injuries have tempered his weight training in recent years, as his latest movies and photos show, he is still in incredible shape, and shockingly muscular for a man of 67 years. He still performs many of his own stunts, and commits to performing some physical activity daily. "My dream now is to live forever," he told us. "But I doubt it." And then he let out a big laugh.